Next Tuesday, July 24th, T-Mobile will once again be handing out some thank you gifts to its subscribers. In addition, it is promoting a special jackpot of up to $5,000 that is being given away on Q-Live Trivia Game Network. This is a free app that allows you to compete with trivia buffs around the world for cash prizes. You will need to download the app from the App Store and the Google Play Store; at 8:30pm EDT this Tuesday, you can compete for as much as a $5,000 special jackpot. We do need to warn you that several people who claim to have won money on Q-Live Trivia Game Network say that they never received their winnings due to trumped up TOS violations against them. Six-months free of FC Bayern.tv plus. This is an app that streams highlights and interviews related to the Munich based soccer team. 50% off Roxy swimwear and free shipping. $5 off movie tickets (use once anytime during July) from Atom. 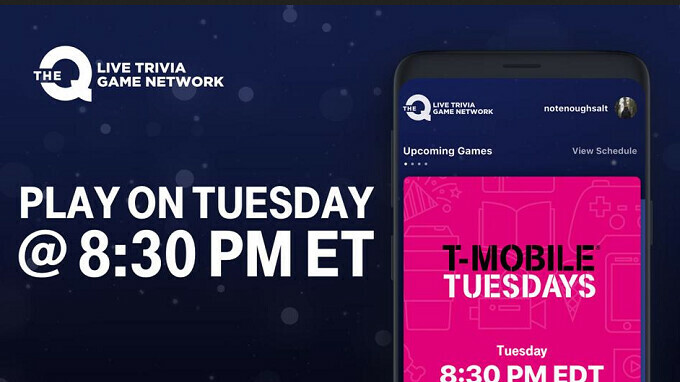 If you're a T-Mobile subscriber, make sure you to install the T-Mobile Tuesdays app from the App Store and Google Play Store. You can collect your freebies by opening the app next Tuesday. I hope the water bottles have little antennas to boost coverage.